At Simplilearn, we greatly value the trust of our patrons. Our courses are designed to deliver an effective learning experience, and have helped over half a million find their professional calling. But if you feel your course is not to your liking, we offer a 7-day money-back guarantee. Just send us a refund request within 7 days of purchase, and we will refund 100% of your payment, no questions asked! Raise refund request within 7 days of purchase of course. Money back guarantee is void if the participant has accessed more than 25% content. Simplilearn’s Financial Modeling with MS® Excel Advanced training enables professionals to handle finance models by applying advanced Excel tools and applications. Financial Modeling is the task of building a model representing financial asset and performance of a business. Financial Modeling skills are must for finance and commerce professionals especially for almost all mid-senior management professionals worldwide. The added skills gained through MS Excel advanced training helps finance and commerce professionals to gain an in-depth understanding of financial modeling techniques to succeed in today’s demanding environment. Why is the certification most sought-after? Given the complex nature of today’s business scenarios, there has been a shift towards using spreadsheets to facilitate detailed, comprehensive financial models. In addition, spreadsheet software also allows powerful data presentation using numerous visual elements through back-end code. Microsoft® Excel is the most feature-rich software for spreadsheet based modeling, and also most commonly used. Currently there are approximately 1500 professionals across the globe who are Certified in Financial Modeling with MS Excel Foundation. What learning benefits do you get from Simplilearn’s training? What are the career benefits in-store for you? According to recent surveys by payscale.com, the median salary of a Financial Consultant can range from $35,933 - $128,051. As per indeed.com, the average income of a Financial Modeling Analyst is $79,000. That was just a sneak-peak into the lesson. Enroll for this course and get full access. The course was quite worthwhile, good presentation of the basics of Financial Modeling & Financial Management. The training is really helpful for those who want to get applied knowledge. Great course content and even better faculty. Training session was very useful and interactive. I can implement the learning in my day to day work. Trainer was really impressive and solved our complex problems easily. It was a good learning and this course was quite useful. Highlight was the trainer "Sameer Kalra". He is very knowledgeable and informative and I would say very patient as well. I enjoyed and learned a lot. Very useful training on Financial Modeling. Good faculty presentation. The training was very well conducted. I was able to refresh the existing knowledge and enrich new computing methods. I Would like to do such trainings in future by your concern or the trainer. Completely satisfied with the course content, trainer and training methodology. How do I enroll for the online training? You can enroll for the training online. Payments can be made using any of the following options and receipt of the same will be issued to the candidate automatically via email. What will I get along with this training? You will have online access to e-learning and practice tests along with the training. Can I cancel my enrollment? Do I get a refund? Yes, you can cancel your enrollment. We provide you complete refund after deducting the administration fee. To know more please go through our Refund Policy. Do you provide money back guarantee for the training programs? Yes. We do offer a money-back guarantee for many of our training programs. You can refer to the Refund Policy and raise refund requests via our Help and Support portal. Can I extend the access period? Yes, you can extend the access period by paying an additional fee. Please raise a request via our Help and Support portal. Where and how can I access the e-learning content? Are there any limitations? Once you register with us for a course by paying the course fee, you can have 24/7 access to the e-learning content on our website. An automated course purchase confirmation mail from our side will guide you through the process. I am not able to access the online course. Whom should I contact for a solution? Please raise a request via our Help and Support portal to have your issue resolved. No, the course fee is only for earning PDU's required to appear for the respective exams. Financial modeling is the process of creating a complete mathematical model which helps in any financial decision making. It is a mandatory activity for investment bankers, bankers, project finance persons, equity researchers, Private Equity folks & Venture Capitalists. What is the use of Excel in Financial Modeling? 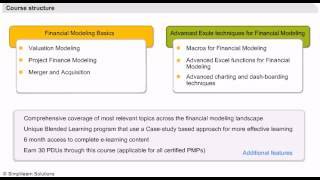 How does Financial Modeling help professionals in their career? How will this course help me? I want to know more about the training program. Whom do I contact? Please join our Live Chat for instant support, call us, or Request a Call Back to have your query resolved. PMBOK 6th Edition Vs. PMBOK 5th Edition: What's Changed? What Is the Real Impact of Social Media? What’s the Difference Between Leadership and Management? AWS Vs. Azure: Which One’s Right for Your Cloud Career? How Can a Salesforce Certification Accelerate Your Career? What Does The Future Hold For Salesforce? © 2009-2019 - Simplilearn Solutions. All Rights Reserved. The certification names are the trademarks of their respective owners.